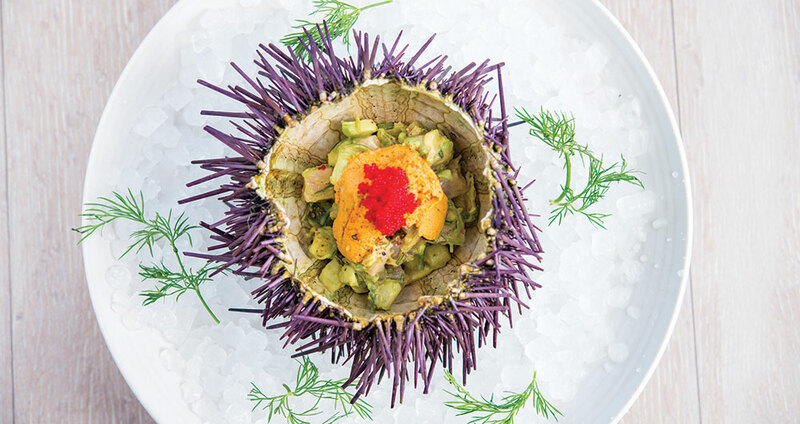 Dine on the best and the most unique uni dishes in Orange County. Sea urchin aficionados hold the spicy creature, uni in Japanese, in the same exalted regard others reserve for foie gras or caviar. Most devotees, who find in it the flavor of the sea at its most heavenly, consume it as sushi or sashimi; they might consider Bluefin in Newport Coast. But there are other ways to enjoy it. At Sushi Roku in Newport Beach, it is key to the uni udon and blue-crab tartare. Driftwood Kitchen in Laguna Beach offers whole Santa Barbara Sea Stephanie Fish uni with sweet kelp, above. Bravo Top Chef finalist Amar Santana starts his day with the Dory Fleet so he can offer erizos con huevo, fresh sea urchin scrambled eggs with miso-butter toast, at his Vaca in Costa Mesa—caviar optional.